1. Set a rack in the lower third of the oven and preheat the oven to 325°F (160°C). 3. In a medium heatproof bowl, combine the chocolate, cocoa powder, and vanilla. 4. In a small saucepan over medium-high heat, bring the coffee and cream to a boil, stirring occasionally, about 3-4 minutes. Take the pan off the heat, pour the coffee mixture over the chocolate mixture, and whisk until the chocolate melts and the cocoa powder dissolves. Let cool completely, about 10 minutes. 5. In a medium bowl, whisk together the flour, baking powder, baking soda, and salt. 6. In the bowl of a stand mixer fitted with the paddle attachment, beat the butter at medium-high speed until creamy, 2 to 3 minutes. Add the sugar and beat until light and fluffy, about 3 minutes. Add the eggs, 1 at a time, and beat for 1 minute after each addition, scraping down the sides of the bowl as needed. Reduce the speed to low and beat in 1/3 of the flour mixture, followed by 1/2 of the chocolate mixture. Repeat with another 1/3 of the flour mixture and the remaining chocolate mixture. Finally, add the remaining flour mixture and beat just until incorporated. 7. Remove the bowl from the mixer and scrape down the sides of the bowl with a silicone spatula, reaching down to the bottom to incorporate any unmixed dry ingredients. Scrape the batter into the prepared pan and smooth the top. 8. Bake until a wooden toothpick inserted into the cake comes out clean, 50 to 55 minutes. Set the pan on a wire rack to cool for 10 minutes. Invert the cake onto the rack, set the rack over a baking sheet lined with parchment paper, and let cool completely. 9. Put the chocolate in a medium heatproof bowl. 10. In a medium saucepan over medium-high heat, bring the cream, sugar, and vanilla to just below a boil, stirring frequently. Take the pan off the heat and pour about 1/2 of the hot cream mixture over the chocolate. Stir gently with a spatula until blended. Add the rest of the hot cream mixture, stirring gently until the chocolate melts completely, about 5 minutes. Immediately scrape the glaze into a small heatproof pitcher and pour it over the cake, allowing it to drip down the sides. This chocolate Bundt cake was easy to put together. The result was a rich chocolate cake that was not cloyingly sweet. Easy to cut, good crumb, and nice mouth feel. The only change I made to the recipe was using 4 grams Extra Bittersweet Chocolate (70% cacao) and 1 gram Unsweetened Chocolate (100% cacao) for both the cake and the glaze. I used Bakers Joy to butter the Bundt pan, which resulted in the cake coming out of the pan with no sticking. It tastes as good 3 days after making it as it did right out of the oven! This recipe is a keeper. When a recipe starts with rich chocolate ganache to build the batter and ends with more ganache to glaze the cake, you know you’re in for a treat! I followed the recipe to a "T" with all ingredients at room temperature, batter beaten for the full recommended times, good quality 70% chocolate, and the results were worth the little bit of extra effort. The cake baked up tall and proud and slipped out of the pan without any prodding. The crumb was moist, the texture fudgy and deeply chocolatey almost like a brownie. This easily served 12 people with coffee but it would be splendid plated up with a scoop of vanilla ice cream and maybe a raspberry or two for a more elegant dessert. I was concerned that there might be too much batter and/or that the chocolate flavor might not be strong enough, but I was wrong! The batter came to the top of the pan, but not over the edge and the aroma and taste confirmed that using the dark chocolate and blooming the cocoa packed a powerful punch. As for the comment about it keeping well for days, I doubt I'll ever find out! This one disappeared in a heartbeat! It seemed fitting that this recipe arrived the week before National Bundt Cake Day and, because I am a girl who likes to follow tradition, I chose to test the cake on the day. I grew up one mile from the NordicWare factory (maker of the infamous Bundt Cake Pan) in St Louis Park, Minnesota. I did not appreciate the significance of this historic place amongst midwest bakers until I, too, became a baker, and shopping at their factory outlet is always a treat. There is something beautifully simplistic about a Bundt cake pan—any cake I have ever baked in one always comes together in solid tasty form. 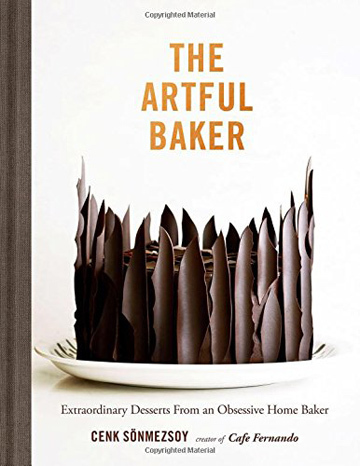 I always judge a cake by the batter—would I eat the batter for pure pleasure, is it satisfying in itself, and would I skip baking the cake all together? Yes, I knew this cake would be a winner judging by my multiple batter tastings after each step. The final cake batter was very light and fluffy much like a chocolate mousse. The glaze could definitely stand alone with its fudgy goodness as an ice cream topping. Coating the cake entirely in glaze would also be perfect. The only suggestion I received from my in-house taste testers was to make the cake even better, insert a fudgy filling as more chocolate is never a bad idea. My cake cooled in the pan for 1 hour 30 minutes, instead of the 10 minutes suggested—oops, I didn’t time my afternoon baking festivities to school pick-up time and piano lessons. Lucky for me, once my boys and I returned home, my cake was easily removed from the pan and ready to glaze. We’ve had it for dessert, breakfast, and afternoon snack and on the third day it’s still as tasty as ever. Dark, decadent, moist, and satisfying! I went out on a limb and made this recipe for the first time to take to a friend’s 50th birthday party. The cardinal rule in cooking is “always try out a new recipe at home before making it for an event.” I broke this rule and just went for it. As it turns out, I had nothing to be worried about. I tasted this cake for the first time along with my friend and the rest of the partygoers. The entire cake was consumed on the spot—no leftovers. The color of this cake is beautifully dark. 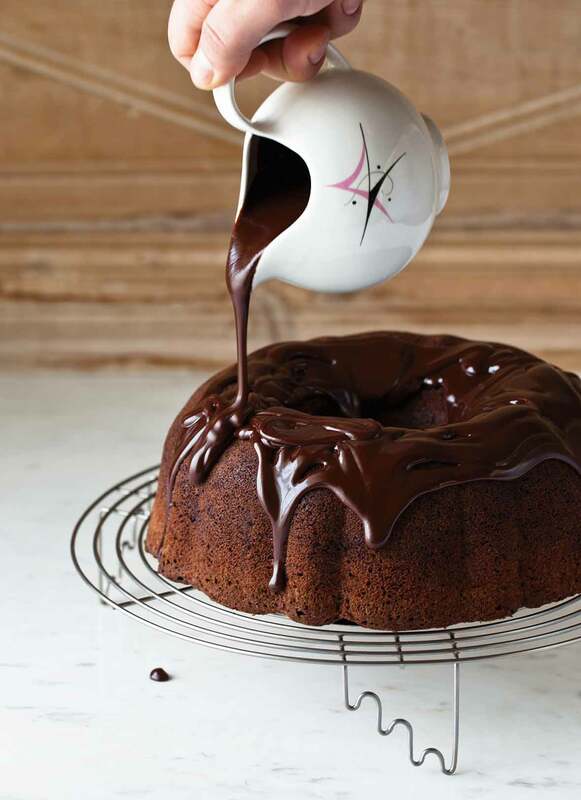 Even without the delicious glaze, the Bundt has a deep chocolate flavor. With the glaze, one gets another rich hit of chocolate. Take the time to carefully butter the pan. This ensures that it slides right out when inverted. Don’t dawdle when transferring the glaze to a pitcher and pouring over the cake. The chocolate begins to solidify very quickly. One person at the party suggested that this cake would be even better served with vanilla ice cream or whipped cream. I do think that this would send it over the top—adding a smooth creaminess to the cake. I will definitely be making this cake again. Cannot wait for another birthday or anniversary or...Monday?! This cake is delicious. Rich and luxurious without being dense. A velvety chocolate cake with a hint of coffee in the background. My family and friends felt this was best eaten the same day or the following day, which is not hard to do. At two days, the cake's flavors had mellowed and the texture had changed a bit. While still good, it wasn’t the "Wow" that it was on the first day. It didn't have the deep chocolate taste and we didn't taste the hint of coffee. While still moist, it was a bit more crumbly. Intense dark chocolate cake with a moist and airy crumb. Delicious! This cake is subtly sweet, emphasizing the dark chocolate. The glaze is perfect to pour over the cake and makes lots so there extra to serve on the side for those who like things a touch sweeter. This cake was a big hit with everyone in the house with my son only waiting long enough for the cake to cool slightly before he cut his first piece. Who doesn’t love a chocolate cake, especially one with a chocolate glaze? It seemed like a good idea for this year’s Thanksgiving and this cake didn’t disappoint. This is a good all-purpose chocolate cake that doesn’t require too much fuss but looks really striking when you add the glaze, which was the perfect consistency. I really appreciate the fact that this cake and the glaze weren’t overly sweet—the sweetness was just right in my opinion, and that let the chocolate flavor shine more! The ratio of ganache to cake was perfect—every piece got a nice coating. I used Scharffen Berger chocolate, which was nice, but not as much of a splurge as Guittard. The inside of the cake is nice and dense and moist. I knew this cake was a hit when my mother-in-law, who does not typically go for sweets, went for another small sliver. As far as servings, you could easily get 20 satisfying servings out of this—I don’t cut huge slices of cake like this. The one criticism I had is that I was hoping the coffee notes would come through a bit more. Chocolate cake recipes are a dime a dozen but few deliver the goods like this chocolate Bundt cake. It's got a delicious depth of chocolate flavor without being too sweet or too bitter. You don't get hit with coffee flavor from the espresso but you know it's there. The glaze is perfect (though tricky if your traveling with the cake, as we were, before it's completely set and you don't have a dish with a dome). The texture is perfectly moist and springy. And, finally, it's not hard to make and fills the house with the amazing aroma of chocolate. So really it’s the real deal, whole package, etc. Oh, and while it's absolutely fine on its own, if you serve it with a dollop of whipped cream, well, it becomes that much better. On day two the cake was a little drier on the edges but was still perfectly moist inside and the flavors held up well. Now, this is a chocolate cake! It’s decadent, easy to make, and better the day after once the glaze soaks in a bit. Plus, a Bundt looks a little fancy without much extra work. The method is super straightforward and, thankfully, the mixer does all the work. At first, I was disappointed at how thin the glaze was when it was warm. Only about 1/4 cup stayed on the cake. I poured the cup that dripped off into a pitcher and served it along the side the cake. No need to warm it, if it’s chilled—it’s still pourable. Since the glaze was thin, it soaked into the cake and kept it plenty moist under the cake dome. This cake could stretch to 16 servings. Now, if you screw up like I did and buy 60% cacao instead of 70%, the cake will still turn out just fine. It’s probably a tad sweeter than intended, but we all loved it. I also added the vanilla to the chocolate mixtures after they cooled. The glaze is super thin. Coming from a purely Midwestern housewife angle, I would rather buy a half pint of cream to bake and glaze this cake instead of buying a large carton and having extra cream left. Would it be so awful to make the glaze with 1/2 cup cream? Chocolate Bundt Cake Recipe © 2017 Cenk Sonmezsoy. Photo © 2017 Cenk Sonmezsoy. All rights reserved. All recipes and photos used with permission of the publisher.